I finally figured out the neck edging for the Baby Zebra sweater. 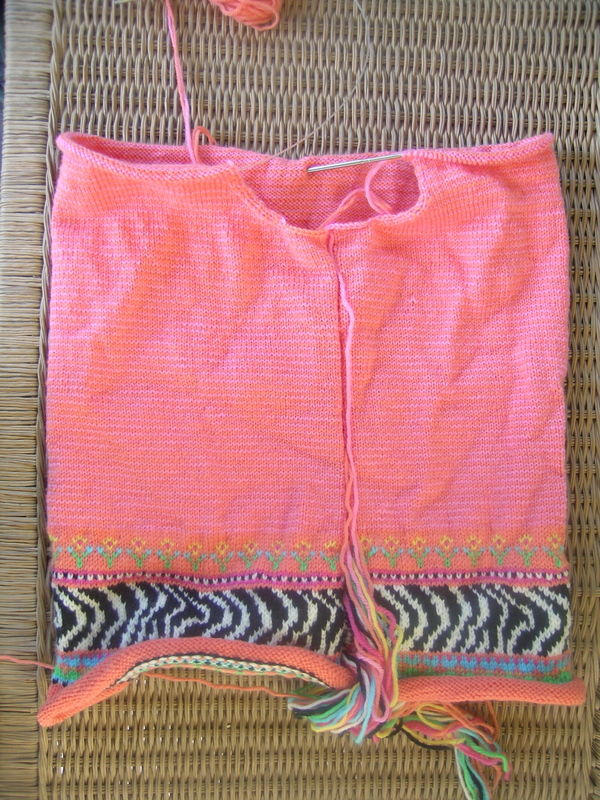 The problem was that the directions are for the body to be knit up all the way in alternating 1 row stripes. Works just fine when you are knitting in the round. Doesn’t work at all when you are going back and forth, unless you want to start a new color each row, as you end up with the working yarn at the wrong end of the row to do the neck decreases. I got some interesting thoughts on the problem from posting on Ravelry, but not a solution that I was happy with. My solution: Bind off the same number of stitches that the pattern requested on the first 2 rows (7 each end), then do a single decrease (one stitch in from each end of every row. Going one stitch in from the edge makes the pick up for the neck band easier). Then, after working 2 rows, slide the needle down and pick up the working yarn needed and start from the opposite end. 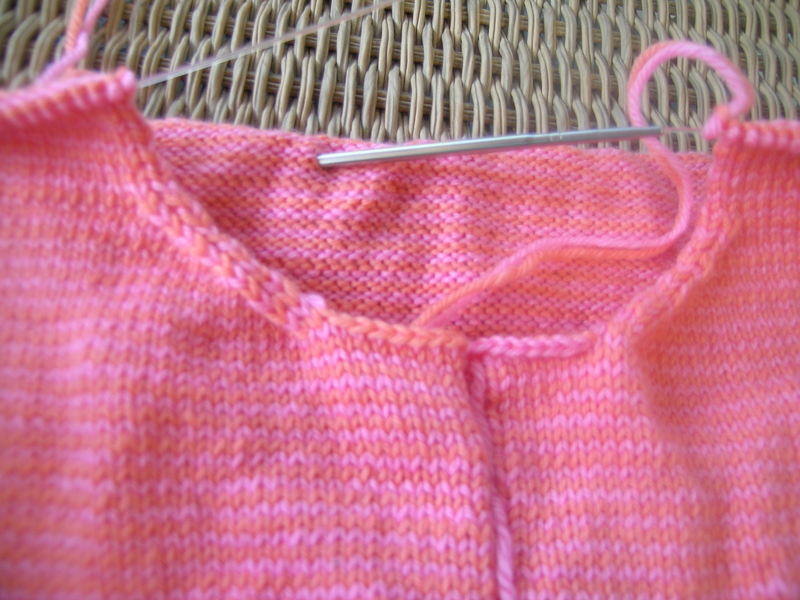 You will end up doing 2 knit rows, then 2 purl rows, and decreasing 2 stitches on every row (one at each end). 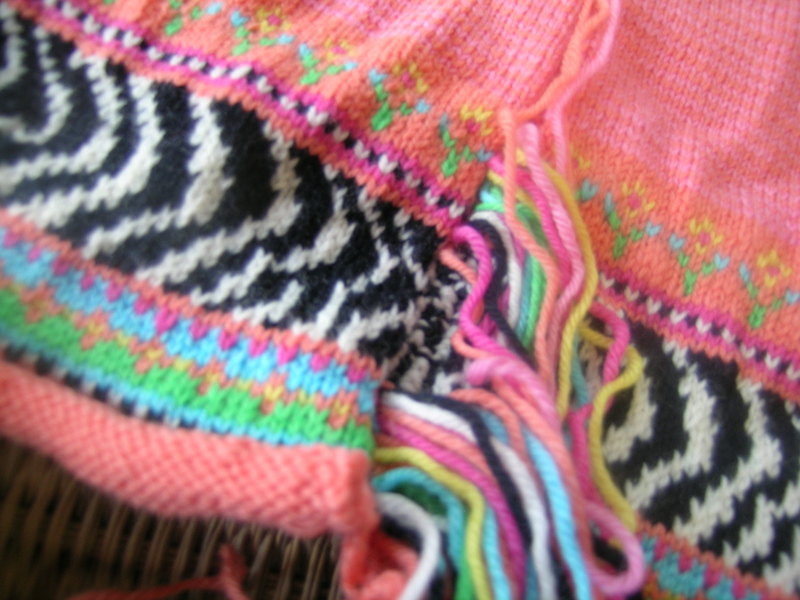 The pattern directions called for 14 rows of decreases after the initial 7, for a total of 14 stitches decreased at each end (4 sts 2x, 3sts 2x, 2sts 4 x, 1 sts 6 times). My plan called for 2 stitches decreased each row for 14 rows, same result, just with a more curved boat neck. BUT, no extra ends to weave in, no fussing around with elaborate methods to decrease, and much easier all round. Now I just have to put a contrast color waste yarn where the sleeves will be set in later (so I don’t have to count after the fact), and I am ready to sew and cut the steek. That is going to wait, however, for there to be at least one other project at the same time. It takes such courage, or leap of faith, that I like to do multiple ones at the same time.